3.The heat-conducting liquid transfer heat to water by the heat exchanger in the water tank. 2) Tinox blue titanium or black chrome coating have very high absoption rate to ensure the high efficiency. 2- What is your Guarantee Time9 6 years; Provide you with some accessories, they are free for you. 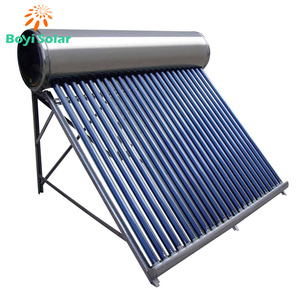 solar panel hot water System Description Vision VNF non-pressure solar water heater incorporates a number of high efficiency flat plate collectors, top situated hot water tank, supporting bracket and accessories. 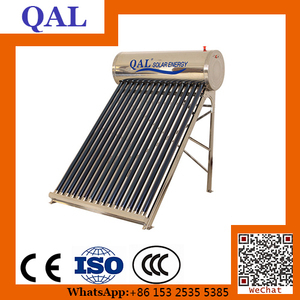 Via T/T transfer, sight L/C, Western Union, MoneyGram, Paypal, etc; Q: Warranty period9 A: 10 years for VISION solar water heaters and solar collectors upon bill of lading date; Q: Accept Alibaba trade assurance order9 A: Yes, in this way Alibaba will guarantee your payment, product quality and delivery; Q: Accept OEM production9 A: Yes, offer to make customized logo on solar products and packing cartons. Q: Working as a VISION dealer9 A: We welcome abroad customers to work with us as a VISION dealer for agreed countries and areas. 4. Stable solar conversion during the day. 6. Ideal for many solar water heating applications. 9. 5 years' warranty for the whole system. 30 meters 700ltrs single coil Dia. 20 meters 700ltrs double coils Dia. 40 meters 1000ltrs single coil Dia. 11 YRS Ningbo Zhenhai Geebo Electronics Technology Co., Ltd. The convection flow will continue as long as the sun is heating the collector. The simple controller can be used to show water temperature, level and control cold water supply or electric element work at set time. (8)Insulation layer: computer auto-control equipment and advanced technics. 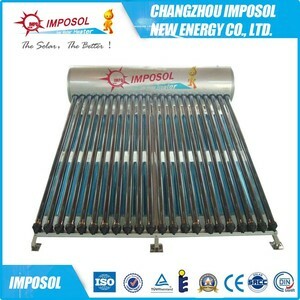 heater water solar Inner tank: Food grade SUS304/2B stainless steel with optional 0.31mm, 0.35mm, 0.40mm, and 0.50mm thick. Or SUS304-2B stainless steel with optional 0.31mm, 0.35mm, 0.40mm and 0.50mm thick. Or stainless steel SUS304/2B with optional 0.31mm, 0.55mm, 0.88mm, 1.10mm thick. 10 YRS Haining Ocean Import And Export Co., Ltd.
: 314415 150L galvanized steel unpressurized sunstar solar water heater for hard water. Provide you with 1%-2% extra accessories and vacuum tubes, they are free for you. 3- Can you accept OEM 9 YES 4- What is your Payment Term9 We accept T/T or L/C at sight, Western Union. &bull; Feeding water automatic: With special design, feeding water automatic, and ensure the outlet water as stable temperature. 3.It can provide hot water with constant temperature; it is safe and more 4.It can supply live hot water, and water can be heated rapidly. 5.It can produce more hot water than general types because it isn't restricted by capacity of tank. 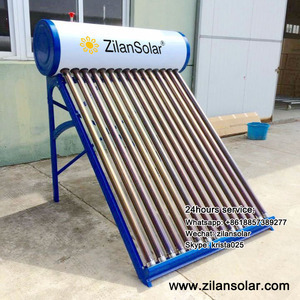 Best Quality Hot Water Mounted Solar Water Heater (China Best Gold Suppier/Manufacturer) with small tank without small tank: How non-pressurized solar water heater works 1. 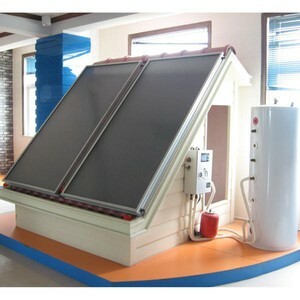 Non-pressurized solar water heater of all glass evacuated tube collector integrated with storage tank, are ideal for use in houses and other applications where cheap, reliable hot water supply is required. 2. As the specific gravities of hot water and cold water are different, cold water goes downward and hot water goes upward. 3. When cold water in evacuated tubes is heated, it becaomes lighter and goes to the water tank, while cold water in the tank goes down to the evacuated tubes 4. Through this circulation, the cold water in the water tank will be gradually heated. 2.if you install the collectors on a pitched roof, the ideal direction should face south-east. 3. A pump- Circulaters water through the filter and collector and back to the pool. Q:What&rsquo;s the shipping cost for a sample to our door9 A:Please advise your address and i will quote to you asap. 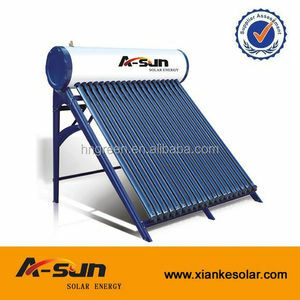 15 YRS Jiangsu Sunrain Solar Energy Co., Ltd.
Alibaba.com offers 22,706 solar water passive products. About 97% of these are solar water heaters, 1% are water treatment, and 1% are valves. A wide variety of solar water passive options are available to you, such as ce, cb, and rohs. You can also choose from evacuated tube, flat-plate. As well as from freestanding, wall mounted. And whether solar water passive is direct-plug, or split. 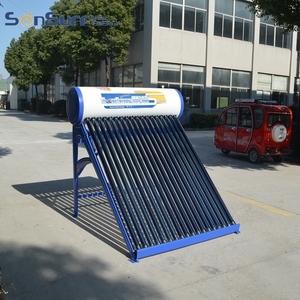 There are 22,706 solar water passive suppliers, mainly located in Asia. The top supplying country is China (Mainland), which supply 100% of solar water passive respectively. Solar water passive products are most popular in South America, Domestic Market, and South Asia. You can ensure product safety by selecting from certified suppliers, including 16,156 with ISO9001, 4,074 with Other, and 3,683 with ISO14001 certification.